August 15, 2014 – Beginning August 18, Fort Valley State University will implement a new system-wide policy that prohibits the use of tobacco products on campus. FVSU will officially become a tobacco and smoke-free campus to be in line with with the new University System Board of Regents Policy 9.1.7 that was approved in March 2014. 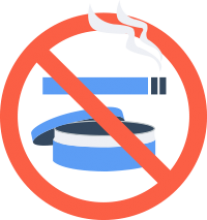 The policy states that the use of all forms of tobacco products on campus is prohibited. To officially launch the new campaign, the University System of Georgia held a kickoff meeting with all 31 member institutions at Middle Georgia State College’s Macon campus in July. Members of the university’s Tobacco and Smoke-Free Council were in attendance, including Hobbs, Human Resources Director Tricia Addison, provost and vice president for Academic Affairs Dr. Jessica Bailey, associate vice president of Business and Finance Dr. Dwayne Crew, and Dean of Students Wallace Keese. FVSU formed a Tobacco and Smoke-Free Council, which submitted a smoke free policy draft to the university’s Administrative Council. It was unanimously approved. The new policy expressly prohibits the use of all forms on tobacco products on property owned, leased, rented or possessed by FVSU. “Tobacco products” are defined as cigarettes, cigars, pipes, all forms of smokeless tobacco, clove cigarettes, and any other smoking devices that use tobacco, such as hookahs, or simulate the use of tobacco, such as electronic cigarettes. The policy also bans any tobacco-related advertising, the sale of free tobacco-related samples and products on all university properties, unless it is being used for research purposes. Additionally, the use of tobacco products is prohibited in all vehicles – private or public – on FVSU properties, and applies to all persons entering the campus area including faculty, staff, contractors, subcontractors, spectators and visitors. The regulations also require that all events held by outside entities on campus will be required to be tobacco free. The Georgia Tobacco Quit Line is available for individuals wanting to quit tobacco use. The Georgia Tobacco Quit Line is a public health service funded by the Georgia Department of Public Health (DPH) through the Georgia Tobacco Use Prevention Program (GTUPP). GTUPP partners with a national tobacco cessation vendor to provide telephone and web-based counseling services in accordance with the United States Public Health Service Treating Tobacco Use and Dependence Clinical Practice Guidelines. It’s a free, confidential and effective service available to assist Georgians with quitting smoking and all forms of tobacco.